The secrets of our genetic heritage are finally being unlocked. The massive scientific effort to sequence the human genome is in fact just the beginning of a long journey as the extraordinary genetic diversity that exists between individuals becomes clear. Work in this field promises much: to understand our evolutionary origins, to define us as individuals, to predict our risk of disease and to more effectively understand, treat and prevent illness. Contemporarygenetic research is allowing the basis of both rare inherited disorders and common multifactorial diseases like asthma and diabetes to be more clearly defined. Huge investments are being made and great advances have been achieved, but the challenges remain daunting. This book provides an authoritativeoverview of this topical and very rapidly advancing field of biomedical research. Human Genetic Diversity describes the major classes of genetic variation and their functional consequences. A combination of cutting-edge research and landmark historical studies illustrate developments in the field, the rationale for current studies and likely future directions. Major structural variants at a chromosomal level are described, as well as copy number variation and sequence level genetic diversity. Evidence of selective pressures in human populations and insights intohuman evolution are illustrated. 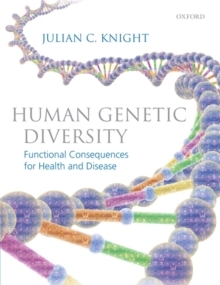 The book describes the development of linkage analysis and more recently genome-wide association studies to define the genetic basis of disease, current approaches to defining functional causative variants and the emerging fields of pharmacogenomics and individualised medicine.